A variety of Chalcedony (the Quartz family), Moss Agate is clear to milky white with inclusions of manganese or iron in patterns similar to lichen. It’s found throughout the world, with the best specimens from Australia, Russia, India, and the U.S.
First discovered in the third or fourth century B.C. in Italy, Moss Agate is a 6.5 to 7 on the Mohs scale (1-10) of hardness. Despite not technically an agate (because it’s not banded), Moss Agate is a member of the agate family. Seafarers used it to protect themselves from surging waters. Legend claims agate protects the wearer from danger and children from falls. As graceful as I am, I should have a sackload strapped to my back! 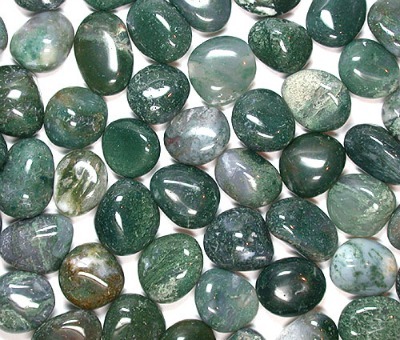 Moss Agate is a stone of wealth and abundance. It’s excellent for small businesses and entrepreneurs, gradually increasing prosperity. Keep a stone near your bank papers to encourage savings. Many churches contain natural works of art reflecting divine images in agate. Moss Agate is believed to be the middle stone in the third row in the breastplate of the High Priest. A stone of warriors, Moss Agate is believed to help the wearer cast aside bitterness and balance the emotions. It’s useful for convalescing after illness and enhancing concentration and perserverence. Moss Agate cleanses the circulatory and elimination systems, as well as eases the pains of childbirth. Sometimes called the “gardener’s stone” for its usefulness in bringing about a full crop (abundance, remember? ), Moss Agate lessens sensitivity to weather and environmental pollutants and promotes self-expression. This stone is associated with the heart chakra, helping us balance ourselves within our environment. Wear it in the middle of your chest to heal emotional disharmony. Feng Shui practitioners say Moss Agate uses wood energy and should be placed in the family (east) or wealth (southeast) area of one’s home. While not an established birth stone, Moss Agate is the zodiac birth stone of those born under Gemini (May 21-June 20) and the mystical stone for those born in September. Clean your Moss Agate in warm soapy water. Avoid exposure to household chemicals or extreme heat. 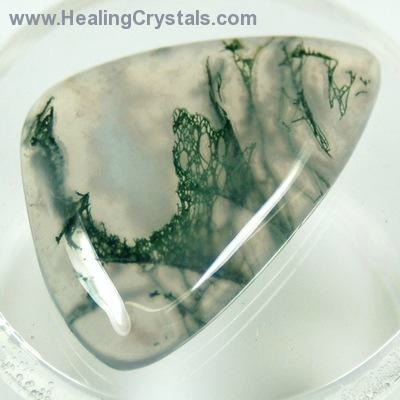 This entry was posted in Sunday's Gem and tagged healing gemstones, Moss Agate, properties of Moss Agate. Bookmark the permalink. Wow, interesting. It really looks like moss is growing in the stone. Love the pattern it creates. I’ll be on the lookout for it here. Thanks for the info! You know, the second photo is the way I’ve usually seen Moss Agate. That first stone is exceptional. Almost looks like lace, it’s so delicate. Something tells me exceptional stones command the highest prices, too! Debbie, that first image of the Moss Agate is faaaaaabulous! It is probably my very favorite picture of that stone because you can see the detail of the inner pattern. How beautiful! Also, because green is my favorite color, that’s most likely why I’m so attracted to this gem! Thanks so much for sharing all the wonderful information your researched on this stone, I learned A LOT from it! I didn’t know that. And I too have a tendency to be “less graceful” as I should be; therefore I should be wearing this stone on my back as well – ha! Again, thanks so much for sharing these posts, my friend. I really enjoy them!!! Ron, surely you’re kidding. You, less than graceful? Nah, I don’t buy that. You’re an actor and a healer — you’re bound to be cognizant of movement. I, on the other hand, fall way more often than I should. I guess I just get in too much of a hurry. Frankly, I’m tired of landing on the ground, though, and am trying very hard to be more careful! Isn’t that first photo lovely? That lacy detail is so striking. Very nice, Debbie. It does seem aptly named. I had not seen this one before, either. I love how many of this stones are said to contribute to the balance of energy and harmony, makes it a bonus to own beautiful gemstones. I’ve been making quite a bit of jewelry this summer, I may have to put this one on my list too! I haven’t spent near enough time beading this summer, Lana — lucky you! Seems I’ve had more than enough trouble with hackers and their ilk of late, both for my own websites and those of my clients. Sadly, I don’t think the “good guys” are keeping up with the trouble-makers. Wow, that always sounds scary. The world we live in… I do enjoy jewelry making, I have done very little for myself, as I have sold most of it. It is one of my side businesses in the summer, or as they call it these days, “side hustle.” Lol, that sounds illegal. It is still fun to make it, though. Well, down with the troublemakes, I say! Goodness! This one seems to do just about everything! I love the green shades of it and that first picture really does look as if it’s got moss inside it – like something caught in amber. Funny, isn’t it, how some of these stones almost sound like magic potions, ha! This one isn’t a stone I have a lot of, probably because it’s not commonly found at my usual bead stores. It’s available online, of course, and from its description, I probably should invest in a few pieces. This is one I’ve heard of, and it really is a beauty. It always looks nice when polished, but that stone you’ve shown at the top is exceptional. The only bit of advice I have is not to strap a bagful to your back to prevent falls. If you did, you’d probably fall backwards, and have to lay there like a beetle on its back until someone flipped you over or helped you up! HaHa, you’re so right, Linda. The last thing I need is a sackload of stones pinned to my back. The image of that poor beetle struggling to right itself is going to stick in my mind all day! This is really a beautiful stone. I’m sure I’ve never seen one. Did you plant this stone near your Roma tomatoes? I’m going back in time on posts here – but I saw how prolific they are. Actually, I’m a bit afraid to plant a stone in the garden or a hanging basket — I don’t think I’d remember to remove it at the season’s end, ha! !